The client for this project was a private businessman who spends his time between New Zealand and China. This project was quite an undertaking, with a complete strip of the apartment and a rewire as if new. As such, we had to plan carefully before starting any physical work. The job involved working very closely with the builder, our CAD designer, and the interior designer to bring together a finished product which looks and operates seamlessly. 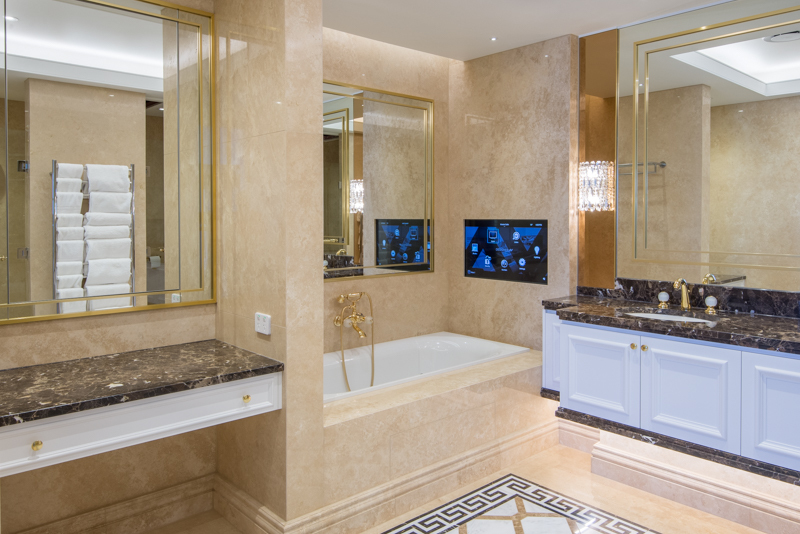 The full 4K video was distributed to all 4 televisions in the apartment, including one in the master bathroom which was built into the wall. An automated lifter was installed for the TV above the fireplace, allowing a more comfortable viewing angle as desired. The home theatre system with full Surround Sound contains three hidden subs and several custom-built Leon profile speakers fashioned into the cabinet. The client is a music enthusiast and was assured in having full hi-res audio distribution to all the bedroom and TV areas. 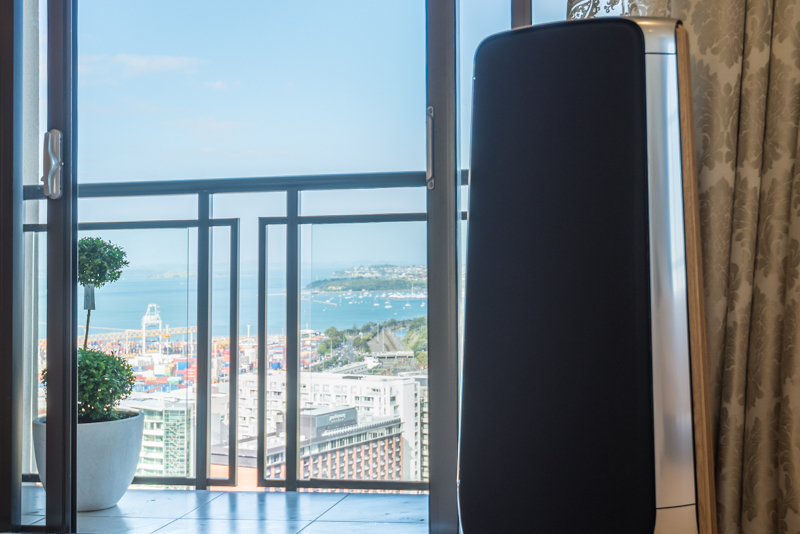 The system can stream Spotify, Tidal or any music they want to any other room in the house, but in the formal lounge, we installed a pair of high-end B&O Beolab 50 speakers which look and sound absolutely incredible. The apartment now also has fully automated lighting, blind and curtain control. 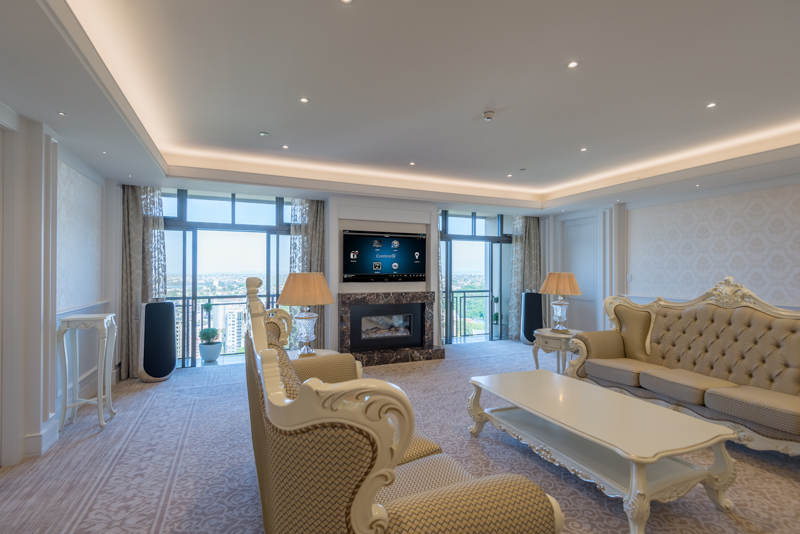 This allows the client to control the lights in every room of the apartment, not only switching them on or off but also the brightness levels for mood setting. We also integrated with the buildings aircon system, giving the owner total control over his heating. Temperature settings can be pre-set or adjusted with the touch of a button. The apartment also has 4Sight, allowing the client to remote control the system from anywhere in the world. The heating, lighting, and music can all be activated in advance, making the room nice and warm for arrival. 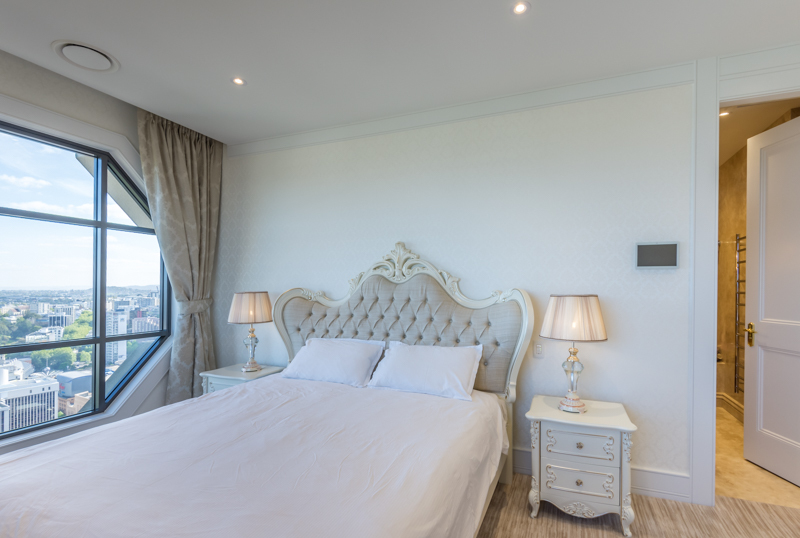 Blinds and curtains can be opened or closed depending on the time of day, and the system also has an “away down” button, shutting the apartment down in one simple command. TVs, speakers, and amplifiers are all powered down, lights are dimmed and the aircon is turned off, cutting down on power consumption. 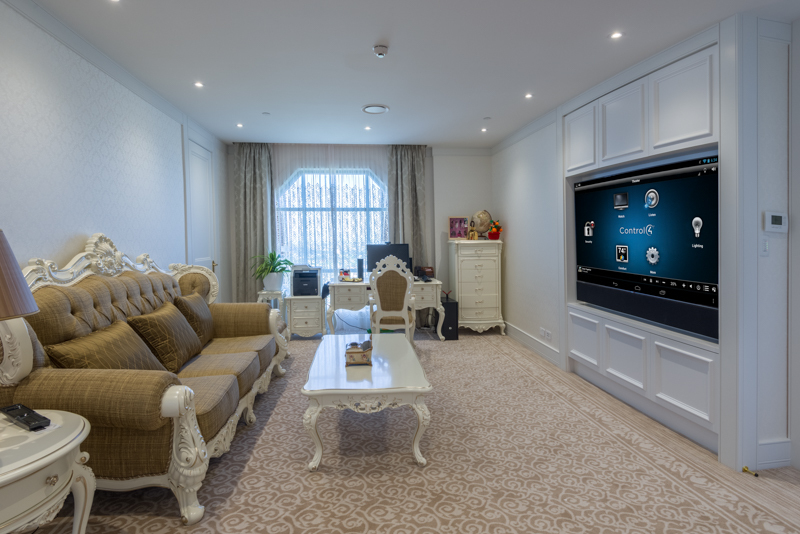 We used Control4 as the main automated system, allowing the client total control over the apartment, both while sitting on the sofa or back in China. The client can use several touch-screen devices around the apartment, as well as a portable touch-screen for his private television room, along with handheld remote controls. On top of that, the Control4 system can be used via phone or tablet apps and keypads on the wall. Everything works like a charm, and the client couldn’t be happier. This job turned out so well that Designer AV won an award at the dealer conference for 2019! 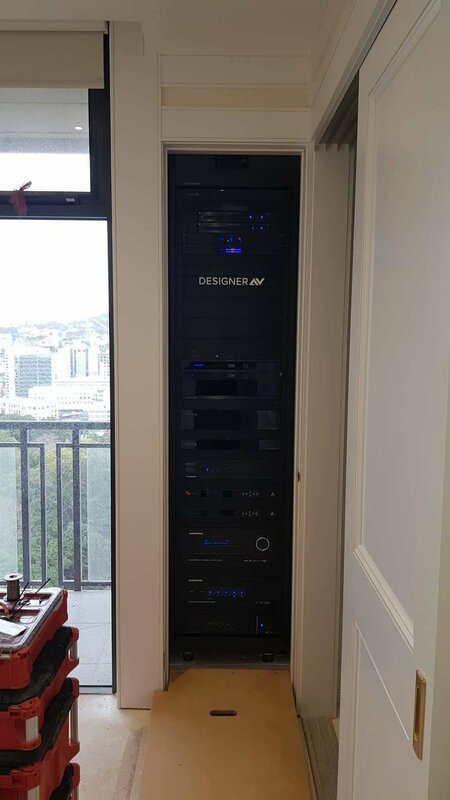 Check out some of the images below to see how smoothly everything fits together in this beautiful apartment in the heart of Auckland.